Michigan Department of Career Development, "Annual Report," 2001. Cynthia M. Fagnoni, "Workforce Investment Act: Implementation Status and Integration of TANF Services," testimony to the Subcommittee on Postsecondary Education, Training and Life-Long Learning of the U. S. House of Representatives Committee on Education and Workforce, and the Subcommittee on Human Resources of the House Committee on Ways and Means, GAO/T-HEHS-00-145, June. 29, 2000, p. 1; Daniel O’Shea and Christopher T. King, "The Workforce Investment Act: Restructuring Workforce Development Initiatives in States and Localities," Report # 12, Albany: Nelson A. Rockefeller Institute of Government, State University of New York, April 2001. New York v. United States, 505 U.S. 144 at 174 and 178. 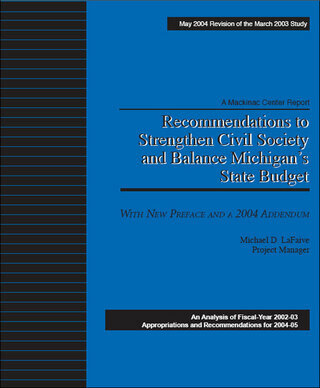 Michigan Department of Career Development, "State of Michigan Strategic Five-Year Workforce Investment Act Plan," http://www.michigan.gov/mdcd/0,1607,7-122--8809--,00.html Oct. 31, 2002. Established in 1993 by Executive Order 1993-3 See http://www.michigan.gov/eMI/Portal/CDC/Components/eMI_CDA. Created by Executive Order 2002-05 by Gov. John Engler on Mar. 27, 2002. Michigan Department of Career Development web page, "Michigan’s Workforce Investment Board," accessible on the Internet at http://www.michigan.gov/mdcd/0,1607,7-122-1683_18969---,00.html. Kimble F. Ainslie, "Staffing Service Industry Under Fire," Current Commentary, Mackinac Center for Public Policy, Sept. 18, 2002; http://www.mackinac.org/4665. Michigan Community Service Commission web site, "MCSC Mission and Vision," accessible on the Internet at http://www.michigan.gov/mcsc/0,1607,7-137-6113-20613--,00.html. Michigan Career Technical Institute web site, "Welcome to the Michigan Career and Technical Institute," accessible on the Internet at http://www.michigan.gov/mdcd/0,1607,7-122-1681_2913---,00.html. Bob Schneider and Barbara Graves, "Line Item and Boilerplate Summary," Career Development and Michigan Strategic Fund, fiscal year 2001-2002, Jan. 2002, p. 8.